1492, Columbus, extermination of the local population, the first centre of the New World. When Columbus arrived in Hispaniola in 1492, the island had around 750,000 inhabitants. The following year Columbus brought with him attack dogs, and these were used against the local population, the Taino, who were enslaved and suffered epidemics. The local population died in such numbers that as early as in 1501 the Spaniards started to import African slaves, who were considered to be better workers. In 1514 there were 29,000 inhabitants, around half of which were survivors of the original local population. During the first few years of the 16th century the Spaniards set up the New World’s first sugar plantations on the island. The capital city Santo Domingo flourished, and it was here that the New World’s first catholic cathedral and first European university were established. 1522, the first slave revolt. The first revolt of the slaves on Hispaniola broke out on 27 December 1522 on the plantation of Columbus’s son. The African slaves burnt the sugar presses and escaped. Most were captured and punished. But some remained free. 1545, Creole culture, slave revolt, Maroons, Taino, African religion. In the mid-16th century it is estimated that there were about 7,000 escaped slaves (Maroons) living in the mountains on the very southern tip of the island. Also with them were remnants of the original Taino population. As long as slavery existed, slaves escaped up into the inaccessible mountain regions. The slaves came from many different African backgrounds and spoke different languages. In order to understand one another, they developed a Creole language with elements of Spanish, French, Portuguese and languages from the African Gold Coast such as Yoruba, Bantu, Biafra, Ibo, Fon, etc. The escaped slaves built simple clay fortifications and attempted to reconstruct their African culture and religion in the new environment. One part of this culture comprised the Taino element. In Vodou, the spirits of the Taino are respected as the island’s true population. Much of the Vodou knowledge of medicinal plants has its background in Taino. During the 17th century a plantation-based economy developed, based on the cultivation of tobacco and indigo on the western side of the island, where there was an increasing French influence. 1697, French colony, sugar plantations, increased slave trading. By means of a treaty in 1697, Spain released the western part of Hispaniola to France. It became an official French colony under the name of Saint Domingue (what was later to become Haiti). At the time there were 6,000 white and coloured people in the colony, as well as 50,000 black slaves. From 1700 until 1704 there was a dramatic increase in the number of sugar plantations, from 18 to 120. Imports of African slaves also increased dramatically. It was sugar production that really gave a boost to the plantation-based economy. This was more capital-intensive production that required fertile land, irrigation, a large workforce (slaves) and expensive equipment. A plantation would often have several hundred slaves. 1750, half a million slaves enforced conversion to Christianity, resistance, early Vodou. In 1750 there were about half a million enslaved Africans and only 40,000 French colonists living in Saint Domingue (Haiti). Catholicism was the official religion of the French colony. African slaves were forced to undergo christening. But an underground religion (Vodou) started to emerge among the slaves. It was a combination of African religious traditions with elements of Catholicism. But several of the early Vodou priests, who were also leaders of the revolts, came from a Muslim background. Vodou became a source of resistance and unity against the French. The most famous leader was Makandal, who escaped from slavery in 1751. He was captured in 1758 and burnt at the stake. For the colonial power, Vodou equalled revolt. To practise any rituals other than Catholic ones was forbidden. It was also forbidden for slaves from different masters to gather, even for Catholic services. The punishment was to be whipped and marked by a branding iron. Anyone caught at a gathering who was already branded could be sentenced to death. 1773, colonial goods, the richest economy in the world. In 1773 Saint Domingue (Haiti) produced 110,000 tonnes of sugar, 80,000 tonnes of coffee, 2,000 tonnes of cotton and more than 70 tonnes of indigo. At the end of the 18th century the French colony accounted for half of the world’s coffee exports, and exported as much sugar as Jamaica, Cuba and Brazil did between them. Fifteen per cent of the 1,000 members of the national assembly of the French Revolution in 1789 owned colonial properties, and many more worked in the colonial trade. The slaves on Saint Domingue (Haiti) were involved in laying the material foundations of the French Revolution. A third group comprised the free people of colour, i.e. children of French fathers and African mothers. One quarter of the colony’s properties and slaves were in the ownership of the free people of colour. In the 1760 the race laws became tougher. In 1779 free people of colour were forbidden from adopting white people’s clothing, hairstyles, style and deportment, and also from travelling in carriages. 1790, the revolt of the free people of colour. Vincent Ogé gathered an army of several hundred free people of colour. But his revolt was crushed. Ogé and 19 other members of the revolt were executed. 1791, slave revolt, Boukman, Vodou as an underground force for unity. On 21 August 1791 a slave revolt broke out. By the end of September the army of slaves had destroyed more than 200 sugar plantations and almost 1,200 coffee plantations, and brought together tens of thousands of escaped slaves. Secret Vodou gatherings organised support and Vodou priests were important participants. The leader of the slaves during the first days of the revolt was Boukman. He is said to have reached an agreement with the island’s spirits to serve them for 200 years in return for their support in the battle for liberty. It is said that Boukman sealed the agreement by drinking the blood of a black pig that had been sacrificed, although it is difficult to find historical proof of this event. Boukman was killed in November 1791. Even though Vodou was important in terms of co-ordinating and inspiring the revolt, it was primarily a political battle. After many years of war, the slaves and the free people of colour won their liberty, although France did all it could to retain control of its richest colony. On 1 January 1804 the former slave Jean-Jaqcues Dessalines declared the freedom of the Republic of Haiti. This was the second free state in the New World after the USA, and the only state to have arisen from the liberation of slaves. No one recognised the new state, which was instead met with isolation and boycotts. This exclusion from the global market led to major economic difficulties for the new state. 1835, Vodou punishable, secret societies. Towards the end of the 19th century 80% of Haiti’s national budget was spent on repayments of loans for the payment of compensation to France. 1915, USA invasion I. The coloured elite is strengthened, Vodou as resistance, again. Black consciousness. In 1915 Haiti was invaded by the USA. The occupation continued until 1934. The USA took over the national bank to guarantee payments of foreign debts and created a military force that later came to dominate the country. Among black intellectuals a movement grew up seeking greater awareness of African roots in relation to the black consciousness movement in the USA. There was strong resistance to the occupation, with Vodou societies playing a central role. The Catholic church welcomed the USA’s occupation, and this led to even greater repression of Vodou. It was during the period of occupation that Haiti gained a reputation in the USA as an exotic, mystical island. 1941, tyranny campaigns against Vodou. In 1941 Élie Lescot was made President, and was given the support of the USA when he backed the allied forces during the Second World War. His regime was corrupt and tyrannical. During Lescot’s regime the Catholic church waged a campaign against Vodou. Priests and priestesses (moungans and mabos) were imprisoned, temples and artefacts were destroyed. Vodou societies conducted their rituals and night and at secret locations in the countryside. In the 1940s there was also a large-scale Protestant mission in Haiti. 1947, free of dept final colonial repayment. In 1947 France received payment of the last instalment on the debt that had kept Haiti in poverty. 1950, military coups, studies into Vodou start. The economy worsened and poverty increased in Haiti, leading to military coups in 1946 and 1950. A black middle class emerged during the 1950s, and there was greater tolerance of Vodou. The first serious studies of Vodou were conducted, based on knowledge and respect. Vodou rituals were also adapted for the emerging tourist industry. 1957, Papa Doc, Vodou as a means of exercising power. In 1957 the doctor and anthropologist François Duvalier, later known as Papa Doc, was elected President. He put an end to the political dominance of the established elite. Many educated Haitians fled. Papa Doc Duvalier viewed Vodou as a part of Haiti’s African heritage and associated the Catholic church with the elite that he wanted to replace. He used his knowledge of Vodou to establish his power. Vodou priests were recruited as informers, and secret societies such as the Bizango were used to suppress common Haitians. Papa Doc Duvalier’s regime degenerated into a brutal dictatorship.. Tens of thousands Haitians were murdered or forced to leave the country. These attacks continued when the son Jean-Claude (Baby Doc) succeeded the father in 1971. 1972, free to practise Vodou. Since 1972 it has been possible to practise Vodou freely in Haiti. 1986, military coup, President Aristide, religious freedom, flight. In 1986 there was a new military coup, which put an end to the dominance of Duvalier. As an element of the breakdown of the dictatorship, which had used secret Vodou societies to suppress the people, many Vodou priests lost their lives. The Catholic priest Jean-Bertrand Aristide was elected President in 1990. A new constitution reinforced religious freedom. After eight months Aristide was overthrown in a military coup. Thousands of Haitians died in the fighting, and several hundred thousand Haitians attempted to flee to the USA. 1994, USA invasion II, UN presence. In 1994 the country was invaded by the USA, which demanded, among other things, that they implemented the economic reforms drawn up by the International Monetary Fund (IMF). The duty on rice was cut from 50% to 3%. Subsidised grain from the USA was cheaper than domestic grain, and production stopped. As a consequence of the tax relief imposed on companies, wages in manufacturing industry fell, and in 1999 they were 20% of what they had been in 1981. Aristide returned as President in 1995. In 1996 Aristide was succeeded by René Préval. Aristide returned to power in 2000. UN troops were supposed to keep the peace, but political unrest continued. Since the 1990s, evangelical Christian movements from the USA have become increasingly well established in Haiti. These organisations distance themselves from Vodou. 2003, Vodou an official religion. 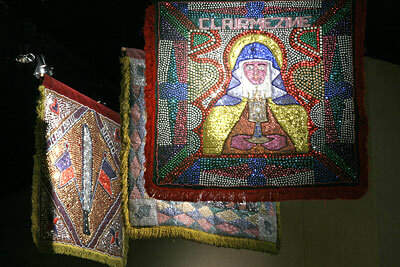 In 2003 Vodou was recognised officially as a religion in Haiti, with the same status as Catholicism and Protestantism. At present 10-25% of the country’s population are Protestants. Some Catholics are critical of Vodou, while practitioners of Vodou are practising Catholics. Protestantism, however, has not become associated with Vodou. In April 2003 President Aristide demanded that France repay the unjust compensation that had been imposed between 1825-1947. The monetary value in 2003 corresponded to 21 billion US dollars. France did not believe that this demand had any legal basis. In 2004 there were major revolts, and the violence escalated. Haiti was also hit by terrible hurricanes and floods, which were followed by epidemics and famine. In 2006 Préval returned as President. Haiti holds elections every five years, which means that a new president will be elected in 2011. 2009, continued poverty, Vodou as resistance. Haiti is one of the 20 poorest countries in the world. Unemployment is high. There is widespread corruption. Large parts of the population are undernourished. Epidemics and illnesses are commonplace. Vodou continues to act as a source of dignity and resistance to suppression. Respect for its art and culture is increasing, both in Haiti and in the world at large. On January 12th, 2010, a terrible earthquake measuring 7.3 on the Richter scale hit the Southern part of Haiti. More than 217,000 people died, 1.3 million lost their homes. An international donor conference in April 2010 approved 9.9 billions US-$ as reconstruction aid for Haiti.